There is a curious detail in Joseph Smith’s earliest accounts of his First Vision that may teach us more about this encounter with Deity, and the differences between the accounts. It is when God greets Joseph. There is a curious detail in Joseph Smith’s earliest accounts of his First Vision that may teach us more about his encounter with Deity, and why there are differences between the accounts. It is when God greets Joseph. Please bear with me as I present the various firsthand accounts, and we will return to the curious detail afterwards. Photograph of original manuscript. “History, circa Summer 1832,” p. 3, The Joseph Smith Papers, accessed April 28, 2017, http://www.josephsmithpapers.org/paper-summary/history-circa-summer-1832/3. Photograph of original manuscript. 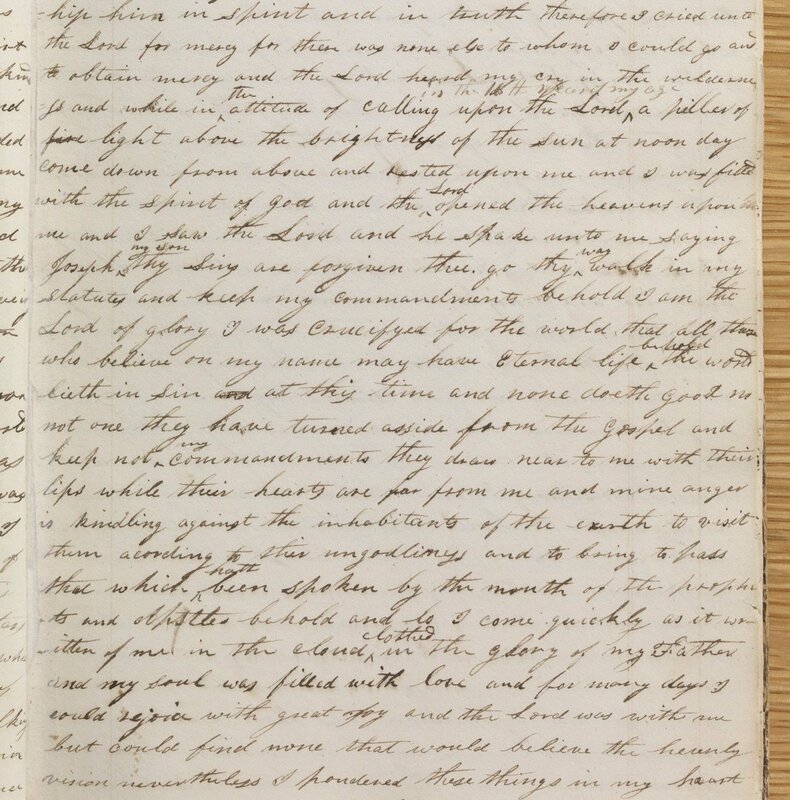 “Journal, 1835–1836,” p. 24, The Joseph Smith Papers, accessed April 28, 2017, http://www.josephsmithpapers.org/paper-summary/journal-1835-1836/25. Note here that Joseph says he saw one personage appear, and then another appeared “like unto the first.” Presumably the second personage is the one who spoke to Joseph and said “thy sins are forgiven thee.” Interestingly, Joseph says that this personage “testifyed unto me that Jesus Christ is the son of God.” If this was Jesus Christ, as in the first account, it sounds as if he was speaking about himself in the third person, which is somewhat odd. Original manuscript. “History, circa June 1839–circa 1841 [Draft 2],” p. 3, The Joseph Smith Papers, accessed April 28, 2017, http://www.josephsmithpapers.org/paper-summary/history-circa-june-1839-circa-1841-draft-2/3. Note that in this account Joseph says he saw two personages (at once? ), and that one of them spake while pointing at the other personage, “Joseph, this is my beloved Son, Hear him.” It is presumed that the person speaking was God the Father, pointing at his Son, Jesus Christ. The rest of the vision is presumed to be Jesus speaking. There is no mention of the forgiveness of sins in this account. Original printing. “Church History,” 1 March 1842,” p. 706, The Joseph Smith Papers, accessed April 28, 2017, http://www.josephsmithpapers.org/paper-summary/church-history-1-march-1842/2. I retired to a secret place in a grove and began to call upon the Lord, while fervently engaged in supplication my mind was taken away from the objects with which I was surrounded, and I was enwrapped in a heavenly vision and saw two glorious personages who exactly resembled each other in features, and likeness, surrounded with a brilliant light which eclipsed the sun at noon-day. This account also notes that he saw two personages that resembled each other in features and likeness, but does not detail anything more about their greeting to him. If Joseph was trying to describe his experience accurately, then why are there discrepancies here in the greeting, and in the number of personages seen? Many explanations have been given for the differences between the accounts, including deceit, fabrication, faulty memory, etc. Here is another explanation, which I don’t believe is original from me, but I want to repeat it because of the deeply mystical implications of it, which are profound if true. I believe Joseph may have been trying to describe a genuine unitive mystical vision of God, honestly and to the best of his ability. When God called Joseph by name, and then referred to his son, God may have been referring to the same person in both accounts—Joseph. Of course, we typically think that in the 1832 account that God was calling Joseph by name, and then referring to Joseph as “my son.” In the 1838 account, we think God was calling Joseph by name, and then switching focus to refer to Jesus Christ standing next to him as “my beloved Son.” But what if, to Joseph, there was no significant difference in his perceived experience? What if he could describe it either way, and be truthful? What if God called Joseph his beloved son/Son, pointing at Joseph, and Joseph perceived himself as Christ, and God told him to listen to the message he would deliver through Joseph’s mind in the roll of Christ. What if there were only two “persons” that Joseph perceived in his mystical experience (which can often seem paradoxical and ineffable), God and himself, Joseph being God’s son/Son, even the Christ. This could help explain why in the 1832 account he says he only saw one person, the Lord, if the Lord was talking only to and through Joseph as Christ. Later, Joseph may have thought it more appropriate, or perhaps even more accurate from a logical/rational non-mystical standpoint, to refer to the Son (Jesus Christ) as a separate individual he saw, rather than the Son being in himself, and so he may have separated the Son from himself as an independent seen personage standing next to God the Father. This is deep. But there is an additional reason why we might consider this to be an accurate explanation of the differing accounts. In the first two accounts Joseph emphasized that God forgave him of his sins. Therefore, Joseph would have perceived himself as completely clean, sinless, and perfect. He would have seen himself as “one without sin,” even as he understood Jesus Christ to be sinless and perfect, “one without sin,” “the sinless one.” Joseph would have become clean and pure in that instant, even the same as Jesus Christ was clean and pure, and in that condition Joseph could have taken onto himself the name-title of Christ. No unclean thing can dwell in God’s presence, so perhaps only “the sinless one,” even a “Christ,” could see God. God may have revealed his Word through Joseph as a “Christ,” an “Anointed One,” perfectly clean from the sins of the world, even as Jesus was. What’s more, if God the Father was seen to “exactly resemble” the Son in features and likeness, God would have appeared to Joseph to look like himself—Joseph. This seeing-oneself-as-God is something which has echoes in ancient mystical texts and traditions, as well as in modern mystical experiences. On the other hand, perhaps this is not valid, and Joseph was simply accounting for different and distinct aspects of his experience. Perhaps God repeated “son” twice, referring to two different individuals, and said something to the effect, “Joseph, my son. This is my beloved Son. Hear him,” with Christ continuing, “Thy sins are forgiven thee…” But that leaves open the question of why Joseph did not mention two seen personages in his 1832 account, something that seems like it would have been a significant detail, especially considering the length of that first account. And who said “Joseph, my son”? The Father or the Son? The 1832 account makes it sound like it was Jesus Christ, the Lord, the one “crucifyed,” from the start. While in the 1838 account, it seems clearly to be the Father that starts the greeting. In the 1842 account, Joseph perhaps got around the issue by simply stating that “they” spoke to him, without providing difficult-to-describe details. Next postCan We Have A "First Vision” Experience? Bryce,what I really appreciated in the Wentworth letter is the following that you quoted : “my mind was taken away from the objects with which I was surrounded”. From other accounts, particularly the one in the pearl of great price, we could believe Joseph beheld his vision with his eyes but this is clearly not the case. Further in Joseph Smith History we can read “the vision was opened to my mind that I could see the plates where the plates were deposited”. Truly asmembers of the church we should stretch out our minds if we want to comune with God and rely less on our own reasoning and intelligence. Pingback: Joseph Smith’s “Sinking” Into the Darkest Abyss to Commune with God – Thy Mind, O Human!